thanks for this website! love your works - they are truly inspirational! Fondest memories of your trips to Perth in the 90s. I still treasure the quilt you made me and had it framed to hang on a wall. Had a wonderful evening with the indomitable Diane Bouchier last night and we remember all those SAA fun lovers who would visit, including Enid Van Heerden, Lulu Lazarus, Nicky Dixon, Vika Fourie and Hannes du Plessis. Love to you from me. Hello my old friend. Your work is inspiring. We haven't spoken in absolute years. How are you keeping? Miss the old SAA days and all the fun we had. It was a delight to meet you at the Hilton Arts Festival and chat about your quilts. 'A true feast for the eyes'. The colours and patterns, shocking the senses, with vibrant life and wonder. I have long frowned upon quilts for ther lack of creativity; -Well, you've shown me! Truly inspiring work, I'll look at quilting with new eyes from now on. I'm really happy to have come across your website, and I hope that I get the opportunity to see one of your shows in the future. Jou persoonsmoontlikhede manifisteer jou Roy. Ek is só bly jy het 'n medium gevind om gestalte te gee aan die mens wat ek weet jy is. Bravo. Roy - Jou werk is AWESOME!!!! Baie groot werk en entosiasme gedoen!! "He who doesn't treasure life, is not worthy of it." - Leonardo da Vinci. All those beautiful colours. I love your passion for the art of quilting and I agree with your staement that quilting 'rules' are there to be broken. I don't think there are enough adjectives to decribe how amazing your work is. Looking forward to the next creation. uit NZ...dis so besonders om jou werk te sien. Waar is die ou dae daar in Lida se huis op Kroonstad ? Your work is more beautiful than ever! Roy, What an experiance to see some of your MASTERPIECES. Now we must see them "LIVE" and come and visit you. We are in Perth and were just talking about the days at the Transit Inn when we were here for 17 days and you "schlepped" the machine in your Delsey. We loved your website as well as the comments from people around the World. Great artistry, Roy! Love you work. Fully support and agree with your statement that you do not make quilts for the washing machine! Neither do I (but I am just a newby in this art) and still only doing the basics and off pattern. Love your Mandela quilt! You never cease to amaze me with your prolific use of colour & design . You are an inspiration . Love the website . Visited the Festival of Quilts in Birmingham, UK this weekend and was absolutely blown away with 'Abel Ascending'. I could hardly tear myself away! So glad to have found your website and see the rest of your work. Sjoe Roy, ek is nou so opgewonde om deur jou website te loer, absoluut wonderlik! Jou passie en energie vir jou werk is werklik besonders soos ook die uitstalling in Yokohama. Hi Roy, Long time no see no hear! Sit hier in Accra en bewonder jou ongelooflike quilts. Hoop dit gaan goed! Sal saam met Hannes 'n draai by jou kom maak. Mooi bly! Hello Roy! Can still see you sitting on "jump seats" and schlepping the sewing machine around on flights! What an absolute "Master" you have become of your trade .. and how your styles have changed over the years! Always knew you were destined for greater things! Fabulous, doll! SO proud of you! Your creativity knows no bounds! An impressive body of work - congratulations Roy. Ek Besit een van Roy se meesterstukke - Dit hang in my sitkamer - en dis al wat daar hang, die fokuspunt van die vertrek. Dankie vir die meesterstuk sal altyd na aan my hart wees. Your Yokohama show took my breath away. And so does your website. You are a complete inspiration, Roy. Thank you. 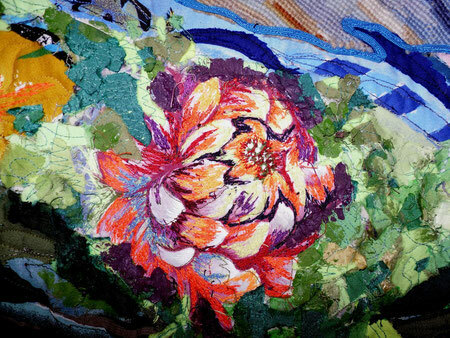 Can't wait to see what pleasures you have for us at the National Quilt festival in July! What I am seeing I can't believe! Amazing work - your use of colour and movement your quilts are alive. Thank you for sharing your beautiful work. In George we are trying to break from the traditional and have started a fibre arts group and your work is a true inspiration. BAIE GELUK MET 'N WONDERLIKE UITSTALLING, ASOOK WEBBLAD. EK ONTHOU NOG JOU EERSTE KWILT (BAIE LANK GELEDE) WAT ONS IN SASOLBURG IN DIE OPENBARE BIBLIOTEEK UITGESTAL HET!!!! JY HET 'N LANG PAD GEKOM!!! Thank you very much for your wonderful Gallery and Stage Talk at Yokohama Quilt Week Show in Japan. Your exhibition was absolutely a great success and so many Japanese quilters were moved by your work. Please come back to Japan when you have another beautiful 20 quilts. We are all waiting for you!" hello roy.Enid se skoonsuster hier, well done! Roy Starke - will I ever forget how you tried to teach me to quilt while being snowed in in Zurich. Will I ever forget the Delsey suitcase, the materials, the sewing machine the treads. Will I ever forget the enraptured Zurich quilting ladies when you spoke with fire and passion about quilting and thinking out of the box. Will I ever forget the special table being rolled into your room upon arrival at the hotel - specially for your quilts. If nothing remains with me of years gone by - your energy and passion for your art will always be there. What a friend, what an artist - exceptional and always mutating. What next may we ask? Only time Roy and his creative mind will show us. You make me proud. Well done - now take up that needle and quilt!!! Moes net weer kom kyk .... en kyk...en dit indrink! Baie werk vir die Yokohama Exhibition. Sou dit graag wou bywoon. Jy gaan hulle uitboul my vriend! Roy, welgedaan!!!!!!! Ongelooflike werk. Kan jy onthou onthou toe ek 20 jaar terug van jou werk gefotografeer het? Evolusie het plaas gevind. Ek is so bly meer mense gaan nou jou talent kan bewonder, danksy jou internet webblad! Jou werk is wonderlik! Doen so voort! Jou werke bly maar net iets besonder. Goed om te sien jy het nou jou eie blad. Nou kan ons almal jou werke sien. congratulations Roy. You are always an inspiration. congartulations Roy!!! I am thrilled you have your own web site. It is wonderful. Now the rest of the world has easy access to view your work. I 1st saw your work at an exhibition held at the Grahamstown Festival and your marvelous ability to embrace a wildly colourfull palette and splash it about with seeming abandon grabbed me by the throat and shook me up and down. I landed joyfully on my feet only to start vibrating with energy again. Congratulations Roy, your vivacious celebration of colour is wonderfull. Congratulations Roy - this is a wonderful way for the world to be able to see your work. BRAVO Roy! It's good to see your wonderful work out and about in the world. The National Museum for Culture and History in Pretoria has been privileged to show case the textile art works of Roy Starke with enthusiastic feed back from the public. He has transcended the traditional craft form of quilting into sublime fine art. In this regard he is a prophet not yet acknowledged fully in his own country. Whilst still tapping into amazing technical skills of quilting, embroidery or needlework craftmanship, he simultaneously shows full awareness of composition, balance, movement and artistic creativity. Standing in front of on of his larger than life format works, is a total onslaught on the senses. Be aware - the art work is a gigantic Wagner composition in large scale streams of movement and colour. The compositions tend to be of abstract architectural construct without fixed rigid form - the enthusiasm, energy of life and exuberant emotion is much to strong for that. My first impressions were that his colloristic use, phenomenal textures and strong compositios are the strong trade marks of an individualistic artist, and after observing the development of his work over the past 10 years, the impression still remains. Nee, nee Almaro! Die rooi lyn is van My hart na SY hart. Ha, ha! Ek is so trots op hierdie nuwe stap Roy! Ry op die weë van die wye internet. Jy is en sal altyd 'n baie spesiale plek in my hart hê. As ek nou 'n rooi lyn na jou hart kan kry, wil ek net sê: "Wel gedaan. Ek is trots om jou vriend te wees." Jy slaan my asem weg!!! Ek sal nie slaap vir die volgende jaar as ek nie een van hierdie meesterstukke besit nie. WHEN 1ST I SAW ROY'S WORK, I WAS SPEECHLESS!!! WHAT OTHER ARTIST DO WITH A PAINT BRUSH, ROY DOES WITH CLOTH. I CAN SIT FOR HOURS MEZERISED WITH ALL THE WORK THAT GOES INTO ONE ART PIECE AND HOW IT ENTERTAINS YOUR THOUGHTS. ROY'S ART HAS NOT YET REACHED THE RECOGNITION IT DESERVES, AND WISH HIM EVERYTHING OF THE BEST. Roy Strake. As mad as a hatter but with a very good soul and heart. Roy's works of art is truly amazing. It is literaly like cloth "imaginary", flowing from a painting artist paint brush. His ideas comes from, like only Roy would say it, "doll, when I receive a fax @ 3AM, then I have to quilt to capture my creative mind".